Hello Julianne and Michael and a big hello to your wonderful families and friends! It was so nice to meet all of you. You guys are wonderful. 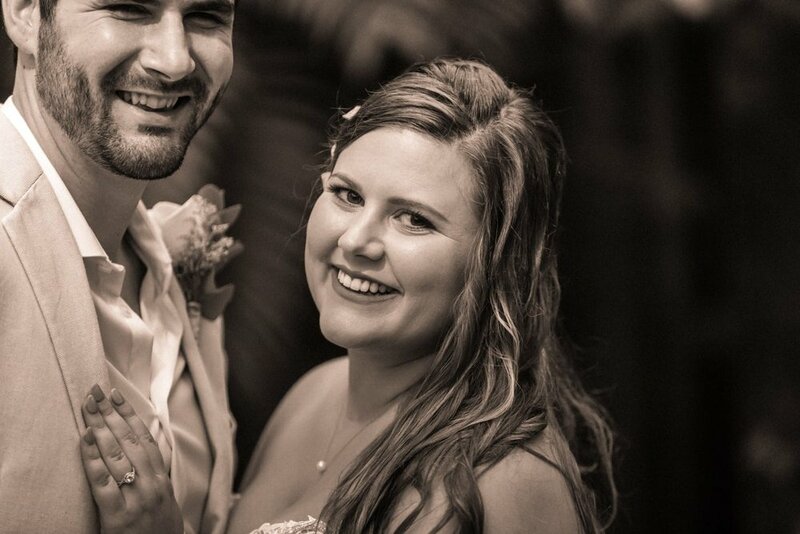 Julianne and Micael, and their amazing families, traveled from Virginia and Florida to see them tie the knot in a tropical paradise. They could not have chose a better location for a waterfall-cloud-forest venue than La Paz Waterfall Gardens in Costa Rica. We met Julianne in the a villa that overlooked the cloud forest and chatted for a bit before starting with photos of her and the bridesmaids preparing. While Julianne put on her wedding dress, I went to the suite where the grooms were preparing and snapped some photos the getting ready for the wedding ceremony. After Julianne had put on her wedding gown, I returned to her villa and took some bridal photos with Lindsay. While the rest of the wedding party finished preparing, we went to the Butterfly Observatory for a First Looks session. We love first looks! It’s a unique and private moment when the bride and groom first see each other dressed for their big day. It was great to see the emotions and love Julianne and Micheal showed and had for each other. Off to the ceremony site! Under the small gazebo with a striking waterfall in the distance, Michael, along with his and Julianne’s family and friends waiting in anticipation. From the dense jungle, Julianne emerged walking arm and arm with her father. You could fee the anticipation in the air. As they said their wedding vows, exchanged rings, and kissed their first kiss as a married couple, you could hear the hum of the water cascading down the mountain. After the ceremony, there was a bit of light left to take photos of the newlyweds at the gazebo with the waterfall in the background. We then took the photos of the the first dance, then the bridal party, bridesmaids, groomsmen, and the family group photos at the bar. We finished the night taking pictures of Julianne and Michael cutting their wedding cake as their family and friends celebrated. Thank you Julianne and Michael for trusting us to photograph this momentous moment in your life. We truly appreciate it. You and your family are truly wonderful. 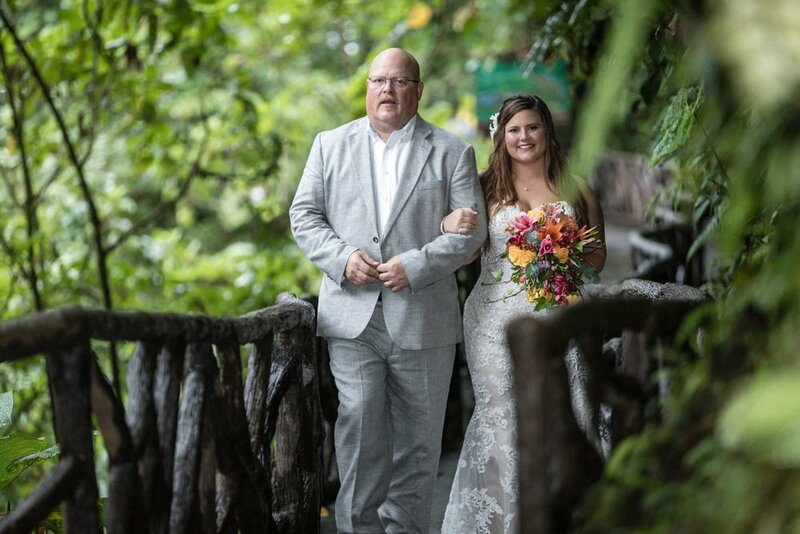 We also would like to thank Hazel Gonzalez, La Paz Waterfall Gardens and Peace Lodge’s wedding planner, for doing such an amazing job. Thanks Hazel! 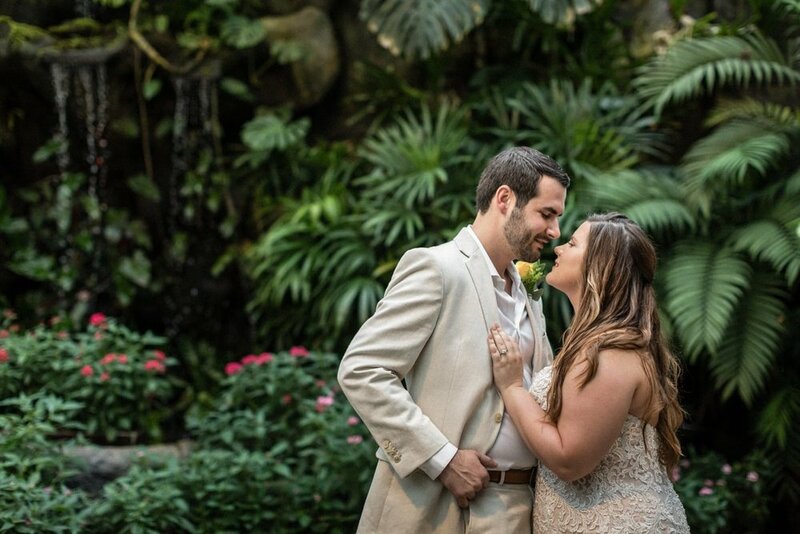 Getting Married at La Paz Waterfall Gardens? at some other Magical Costa Rica wedding venue? Remember it with memorable photos.